In the March Edition of Tech News, ASI announces that Industrial Ethernet Cables and Related Ethernet Products are Available and In Stock! 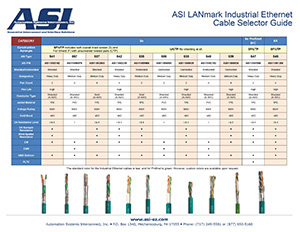 Based on the more stringent requirements found in the factory, ASI requests your consideration of ASI LANmark Industrial Ethernet Cables. For reference purposes, I have listed several of the more popular cables that you may wish to review. This CAT 6A IE Cable is built with 4 twisted pairs of stranded 24 AWG conductors with heavy duty TPE outer jacket. The product is shielded with overall braid screen and foil shield and is high flexibility rated. It is CMX Outdoor and Class I & II Oil Resistance Level rated. 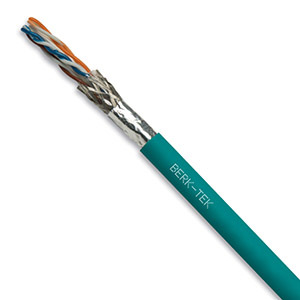 This CAT 5E IE Cable is built with 2 twisted pairs of stranded 24 AWG conductors with heavy duty TPE outer jacket. The product is shielded with overall braid screen and foil shield and is high flexibility rated. It is CMX Outdoor and Class I & II Oil Resistance Level rated. 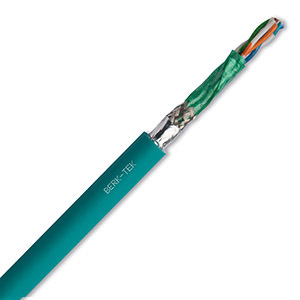 This CAT 5E IE Cable is built with 4 twisted pairs of stranded 24 AWG conductors with heavy duty TPE outer jacket. The product is shielded with overall braid screen and foil shield and is high flexibility rated. It is CMX Outdoor and Class I & II Oil Resistance Level rated. 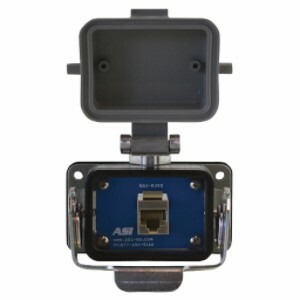 Other Ethernet Product Solutions from ASI-EZ! In addition to the array of Industrial Ethernet Cable offered by ASI, there are additional synergistic products to consider in your applications. I will detail several of these products here. The Remote Access Interface Connector with locking cover should be used when access to an internal panel or enclosure is required without opening the main doors of the device. 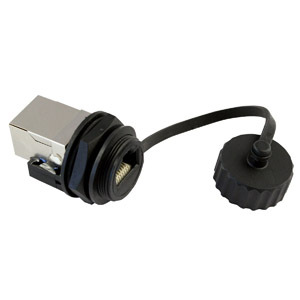 The Remote Access Interface Connector is available with either a shielded RJ45 or an unshielded RJ45 (RAI-RJ45US) depending on your application. This product is ASI's Standard RJ45 Interface Module for quick and easy installation on DIN Rail inside of your panels and enclosures. 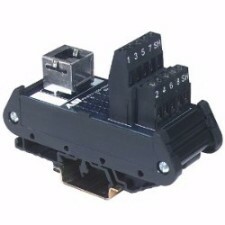 By connecting into the shielded RJ45 connector on one side of the module, you can simply transition to terminal blocks for ease of wiring inside of the enclosure. The RJ45 DIN Rail Interface Module is designed for quick and easy DIN Rail installation. When faced with the requirement to "split & distribute" the Ethernet signals inside of your panels and enclosures ASI offers the perfect solution. All RJ45 connectors on the module are shielded types to protect from cross talk and interference from adjacent devices. By considering implementation of this interface module in your panel, it will prove to be a viable and cost-effective Ethernet wiring solution for many years to come. 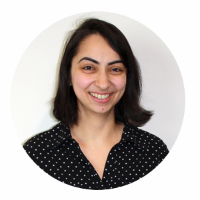 Recently, Priyanka joined the ASI Web Development Team. She works diligently making sure your experience on ASI's website is EZ for you to find the best value in automation, control and power products.